NEW YORK--(BUSINESS WIRE)-- American Eagle Outfitters, Inc. (NYSE:AEO) announces that its American Eagle brand is debuting an innovative and first-of-its-kind marketing concept by placing the creative direction in the hands of the customer. 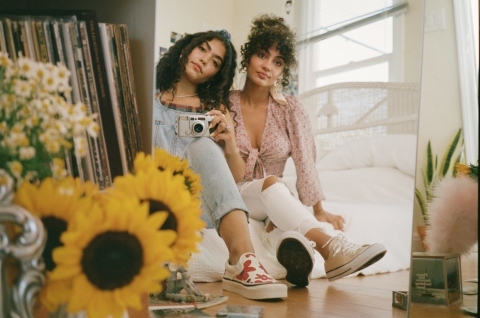 With a focus on AE’s commitment to provide its community with a platform for self-expression and empowerment, the spring #AExME campaign was photographed, styled and creatively directed by ten real and authentic Gen-Z cast members. All cast members were discovered solely through social media, which is a key avenue for youth expression. No exotic location or contrived set was used in the campaign, rather the cast is seen in their own personal environments to showcase the endless possibilities in which the AE community can define their individual style. Instead of enlisting professional photographers and stylists, creativity was taken to the next level through the cast photographing themselves in a series of self-portrait images shot entirely with iPhones and disposable and medium format film cameras. The AE community can see the campaign come to life across AE’s social media, Google Preferred videos, and via in-store imagery. Having a platform to amplify their voices, the cast will share their unique stories, passions, diversity and interests with AE fans online and through @americaneagle social channels. Brinda, is a creator and is on a journey of expressing herself and telling her story via art. Deaunte, is a photographer and visual artist who is passionate about defining what it means to be a young person growing up in an increasingly confusing world. Thor, from music, to film, to photography, he won't let you define him. Antonio, aspires to be a force to be reckoned with in the fashion industry. Cailee, isn't afraid to look past the opinions of others to remain true to herself. Tony , believes that there is one answer to a better world: more love. Mariana , doesn't shy away from pushing her own limits and discovering who she is in the form of music and her passions. Andy , aims to change the world by focusing on happiness and positivity in her photography. Clare, is going with the flow and discovering new passions when it comes to her photography and music. Daevin , is on a mission to spread positive energy through his pictures and interactions on social media. #AExME is American Eagle’s brand platform, which celebrates freedom, inclusion, empowerment and difference. The brand’s commitment to individuality encourages customers to express who they truly are by taking the AE merchandise collection and making it their own. The brand introduced #AExME as a pledge to forgo using models and feature only real customers styling themselves in its marketing. Follow along with #AExME on social, and www.ae.com/aexme to shop the spring collection.